Upgrades to Consider when Installing Coilovers. Many car enthusiasts looking to make an upgrade to their vehicle often focus on that specific upgrade and don’t consider other upgrades that could benefit the initial upgrade. Below we will list other suspension upgrades to consider when installing coilovers on a 2008-2018 Subaru WRX and STi. Upgrading your suspension to ISC adjustable coilovers on your 2008-2014 and 2015-2018 WRX and STi makes for a great increase in handling performance. ISC coilovers will significantly decrease body roll and can lower your vehicles center of gravity, which is beneficial for increased performance both on a street car and especially a track car. While the ISC coilovers will give you adjustable height, dampening, better handling, and a more aggressive look, there are some other things to consider doing that will allow you to get even more performance out of your WRX or STi. ISC Adjustable Control Arms: The 2008-2014 and 2015-2018 WRX and STi do not have rear camber adjustment from the factory. For a stock car with OEM settings in most cases this will not cause any major alignment issues. BUT when you do start lowering your vehicle for the above mentioned benefits the camber in the rear of the car does change, and alignment/ camber settings will become limited due to the factory rear control arms simply not being capable of adjustment. The OEM control arms are also made of a flexy stamped steel, which has its own array of negative side effects (flex, rust, etc). 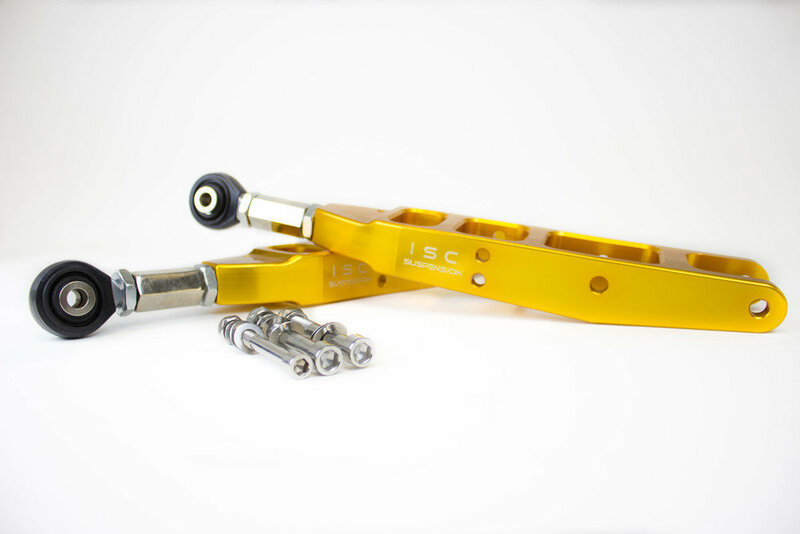 The ISC adjustable control arms give the WRX and STi an instant adjustment range of over 5 degrees! Being made of 6061 aluminum they are stiff, strong, and very appealing compared to the OEM arm. Having this adjustment will allow you to take advantage of your increased suspension features, and help obtain your goals. Whether it is for track purposes (for a Autocross or road course alignment) or the complete opposite settings of obtaining a low and aggressive stance for your show car, these control arms can help make it happen! Triple S Upgraded Coilover Springs: The out of the box steel ISC springs do a great job, but for certain disciplines the upgraded high tensile steel ISC triple-S Coilover Springs are a great option. For individuals seeking custom spring rates, or increased ride quality and performance these springs are a great option for the WRX and STi. The springs themselves are up to 20% lighter, and increase pitch and stroke, which in return yields a better ride quality. Great for a track car, or a street car seeking a custom spring rate or increased handling. ISC Wheel Spacers and Adapters: When upgrading to ISC coilovers sometimes it is beneficial to add wheel spacers or even adapters depending on what wheels you are running on the vehicle. ISC wheel spacers and adapters are made of 6061-T aluminum, hub-centric, and feature top grade hardware (12.9). These will increase track width, and provide a more aggressive stance to the vehicle by brining the wheels towards the outer fender. ISC wheel spacers and adapters come in various sizes, and for the WRX and STI are offered in a 15mm and 15mm width, to accommodate many wheel sizes and offsets. The ISC 5×100 to 5×114 Subaru wheel adapters are a great option for a 5×100 Subaru such as the 2008-2014 WRX to allow the more popular and standard 5×114 wheel fitment choices the market has to offer. Essentially, it allows all WRX owners to use STi wheels! Our ISC coilover covers make sense no matter where you live, the conditions you drive in or what type of driving you do with your car. These covers are made to protect your coilovers from any outside elements keeping them free from debris and functioning as designed for a lifetime! Our ISC rear extenders add an ease of use to those tough to reach spaces when it comes to adjusting the damping levels of your coilovers. Most manufacturers add lots of trim to the rear trunk area which means getting to your rear damping adjustment knobs hard to reach or get at. If you’re car is this way, we’ve got the answer for you! These easy to install, affordable extenders will make it MUCH easier to adjust the damping on the rear (or front) of your coilover with having to tear apart most of the trim or carpeting. These truly are a “no brainer”……..especially for only $35.